Qualification: Graduates and Post Graduates. 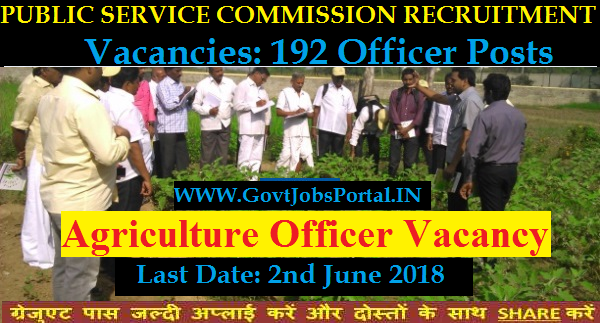 Public Service commission is going to recruit fresher graduate candidates for the posts of Agricultural Officers in Tamil Nadu State. Department mentioned that there are total 192 vacant positions of officers which are going to be filling up by this TNPSC Recruitment process 2018. Those who are looking for a Government job in Tamil Nadu state this is a great career making opportunity for them. Detailed information about this TNPSC Recruitment process 2018 is given below in this article. Those who full fill all the given criteria below can apply for these Government jobs in Tamil Nadu. Job profile Name: Agricultural Officers. Number of Vacancies: 192 Posts. Pay Band: Rs. 37,700 - 1,19,500 Per month + Other Benefits. Can Apply for this TNPSC Recruitment 2018. Post Graduates Candidates can also apply. Remaining all other Candidates has 30 years upper age limit. What Application Fee to be paid for applying this TNPSC Recruitment 2018? Candidates belonging to the following category: “SCs, SC(A)s, STs, MBCs/DCs, BC(OBCM)s, BCMs, Destitute Widows, Differently Abled Persons, Ex-servicemen” need NOT TO PAY anything for applying these Government jobs in Tamil Nadu. While all other Category candidates have to pay Rs.150 as their Exam fee. How Candidates are going to be selected for these Government Jobs? The department decided that there will be a written examination which may be OMR Sheet based or may be CBT (Computer Based Test). Those who clear the first round of written examination will go through the Oral Test conduct by TNPSC Department only. After these two Test candidates will be placed in the vacant positions. Which Process is Applicable for applying these Govt Jobs? The one and only process which is applicable is to apply online with the departmental website. Means candidates who meets with all eligibility criteria given above have to apply online through the official departmental website. Below under IMPORTANT LINK section we share the both link for applying online as well as for the official advertisement. 3rd May 2018 is the Opening Date to Apply online. 2nd June 2018 is the End date for Submission of Application. 14th July 2018 is the Date of Written Exam for Selection.